Our Rent Now listings describe real, actual yard ramps. Currently, two-thirds of our listings are available for immediate delivery, with the balance becoming available some days or a few weeks from now. There are other companies that encourage you to phone them for a quotation; they do not maintain a fleet of available ramps for rent and will typically attempt to turn the conversation into a sales pitch for a new yard ramp. Our interest and our bottom line: working with you to secure a yard ramp scenario that’s right for your business, not ours. With that in mind, we strategically position our yard ramps by locating most of our inventory within 90% of the U.S. continental population. (And let’s not forget our recent delivery to Hawaii.) That’s for everyone’s benefit: this strategy reduces freight costs and results in faster delivery times for our customers. Why rent? If your business has seasonal needs, an outright purchase might not be in your best interest. And, naturally, if a purchase is not within budget right now, the rental scenario would help reduce your expenses (though we encourage you to review our financing option for purchases). A rental also allows you to kick the tires—literally (if you’re renting a mobile yard ramp) and figuratively (for a stationary dock ramp)—to determine how the equipment benefits your operations. Keep in mind that the longer you rent, the cheaper your monthly payment will usually be. Contact us to begin the process. We thank you for the opportunity to earn your business. You have a full loading bay, prepped for your next big shipment, ready for both loading and off-loading. It’s a one-a-year or twice-a-year experience (say, seasonal order fulfillment). A rental of a portable loading dock may well be the most practical and most economic choice for your business operations. Whether for a very short-term period or for a longer stretch of time, let’s explore two main advantages to the rental scenario. The price of purchase for a standard new yard ramp with the most common range of specifications is typically between six and 15 thousand dollars. (Yes, the price of steel—and steel yard ramps—will soon rise throughout the United States, affecting multiple industries, ours among them). Budget constraints might point to the rental of a yard ramp instead of a purchase. 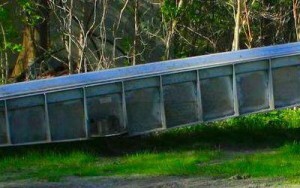 Other factors here might include your ability to avoid interest charges on any financing of a new yard ramp purchase. And consider the length of the rental agreement: most often, your monthly payment will be more attractive for longer rental periods. Better to rent? Better to own? That’s completely your decision. The Yard Ramp Guy team will be more than happy to lend advice, based on our professional instincts and experiences with customer situations similar to yours. If you are not quite willing or needing to commit to a purchase, a short-term rental is a simple and useful way to gauge whether or not it meets your needs. Keep in mind that you can have it both ways: if you and your team determine that the yard ramp provides workhorse value to your operations, we’ll readily discuss turning your rental into a purchase. In our growing experience, sometimes potential customers are reluctant to pursue conversations about the rental or purchase of a portable loading dock because they don’t have the right information or think they’ll make the wrong decision. We can all learn as we go along. We think sometimes it’s great not to know the answer because both parties will discover together and find the right solution in the details. When it comes to important business decisions, we believe there’s honor in asking questions. In our experience we are judged by the questions we ask. 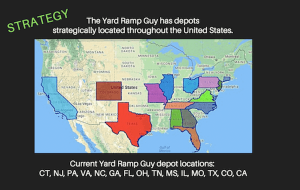 Here, we’re talking about The Yard Ramp Guy’s approach: we place a very high priority on gathering as much information as possible. There’d be no joy, no benefit to business, and no help to reputation if we simply tried to move inventory haphazardly off our depot and onto our customer’s lot. So, we ask a lot of questions. We want to get things right. We conduct ourselves this way so that our customers can gather the right information, make informed decisions, and enter into a contract with the confidence they are acquiring equipment they and their business deserve. We all know the one about the two best days of a boat owner’s life – the day he buys the boat and the day he sells the boat. The Yard Ramp Guy loves this concept as applied to how we guide our customers through their buying or renting decisions. 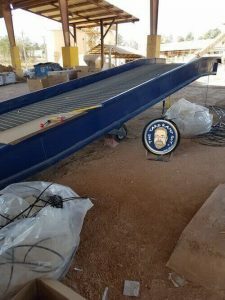 In that first conversation with The Yard Ramp Guy, you’ll also hear us ask about the point at which you think you’ll no longer need the portable loading dock. Right from the start, we’re already gauging a potential buyback. To our knowledge, we’re the only company in the industry dealing with possible exit transactions during the initial transaction. It’s a holistic approach, one that serves us—and our customers—well. The Yard Ramp Guy proudly offers AND delivers solutions for companies that require a short-term yard ramp rental. With this, we’re describing a one-day, one-week, or one-month rental. And that time frame is fairly common in various industries, including uses by stadiums, convention centers, and TV and movie studios. As with delivery of all heavy equipment, freight needs to be factored in. We prefer to see freight charged at less than $1,200 each way. That’s why we’ve strategically located our ten storage depots around the country—in New Jersey, Pennsylvania, Virginia, Florida, Ohio, Georgia, Texas, Missouri, Colorado, and two in California. Location matters: our inventory, impressively, is generally within 250 miles of 90% of the population, which considerably reduces delivery and return freight costs. Often, many people and sometimes many companies are involved in a yard ramp rental situation. Compounding this, the renter also might be a contractor for a third-party using the yard ramp (i.e., at a stadium or arena). And so, we motivate all involved in the rental to be accountable for their roles. As in: the “Customer” is required to be the party responsible for the contract and payment. The “Point-of-Contact” is the person who actually receives the yard ramp and manages its departure. Some companies promote yard ramp rental as a marketing tool, with claims of availability. And that is a key differentiator. We’re The Yard Ramp Guy. Renting yard ramps: it’s what we do. We’ve committed to this corner of the market because there’s a great demand for yard ramp rental. And we continue to grow because we communicate—your expectations and ours—with consistency, focus, and expertise. 1. How long do I need the yard ramp? Most rentals are by-the-month with a one-month minimum. If you need a yard ramp for less than a month (even for a single day), consider that freight fees to deliver and return the yard ramp may be prohibitive. On the other hand, if you need your yard ramp for more than six or eight months, it might make sense to purchase. Be sure though to ask the rental company if they have a buy-back policy (see #3)! 2. How do I know what size yard ramp I will need? The easy answer is to determine the maximum loading capacity of your forklift and multiply that number by three. The loading capacity of your yard ramp must exceed this number. Length and width equally important. For ground-to-truck applications, using an 84-inch wide forklift ramp will match most truck widths. For ground-to-dock applications consider a 70-inch wide loading ramp. Be certain the narrower width does not create a safety issue at your dock opening. Length is critical in any application and necessary for any ground-to-truck use. Yard ramps with level-offs at the top give forklifts more maneuverability and assure the forklift can enter/exit a truck with ease. 3. What is a buy-back policy? Some companies offer customers who purchase a yard ramp the opportunity to sell the yard ramp back for a pre-agreed-upon buy-back price. This is ideal for companies who know they need the ramp a year or more. 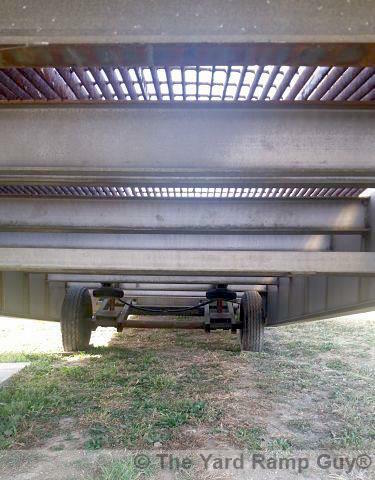 The company will sell a loading ramp to you from their fleet and include a buy-back price. This is a firm price the customer can count upon receiving from the supplier, so long as the yard ramp is in acceptable condition upon completion of use by the customer. 4. What if I want to buy the ramp outright? Do not even consider the rental proposal if this option is not included. So often a luxury once had will become necessity. It is important to have a firm price set as part of the rental agreement. Haggling price on a unit sitting in your possession puts you at a terrible disadvantage. 5. Where is the ramp coming from? Some rental companies offer month-to-month payment plans. While some merit exists in terms of convenience, such terms do impose premium rates. However, most renters know their budget for the yard ramp and are looking to squeeze every last dollar. Look for a rental company that actually requires up-front payment of the entire rental period. These rates will almost always be less, and the rental company usually refunds the unused pro rata portion of the rental fee, so long as you give them enough time to line up another rental. The Yard Ramp Guy has extensive experience in rentals and sales of quality yard ramps. We pride ourselves in our customer service and will gladly answer all your questions—with clarity and detail—to help you make the best decision for your business.